This exercises is a great exercises that incorporates and challenges the player on the ability of passing with both feet, short, long. It also is designed to create movement off the ball and challenges the player to play 1st time balls while in movement, open up body to receive and change direction of pass, support short and long and constant rotation of the ball. At an elite or professional level you will see players execute this sequence in 1 touch. Set Up: 4 Players Grid shape is15 yrds between the cones at the top and 7 yrds between the cones at the bottom. Instructions: Player "1" starts with the ball and performs a "Give and Go" between "1 & 2". player "1" Immediately spins off to get around the cone up top to receive a long pass from "2". on the reception "1" plays long pass into "4" who plays "Wall pass" back into "1" . 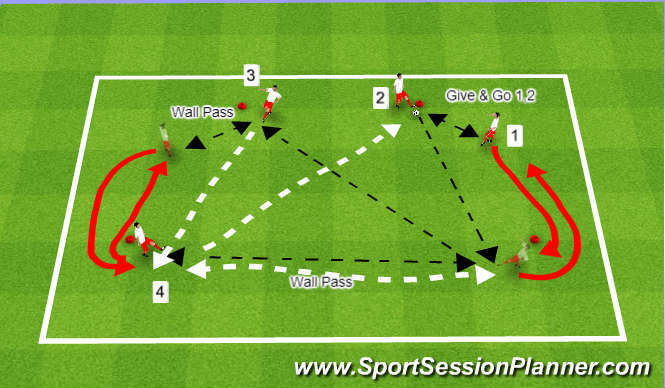 Once player "4" plays the wall pass he/she must spin off to support the long pass into "3" as player "1" is playing long diagonal pass into "3". Sequence continues in the opposite direction. Allow players to execute for about 3min then rotate the players at the bottom position. Coaching Points: Accuracy, timing/pace/weight, support the man, support the ball timing of runs and support.